Russian Defense Ministry spokesman Maj. Gen. Igor Konashenkov. 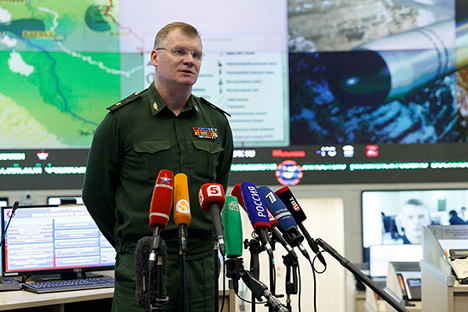 Russia's Caspian Flotilla has no ships capable of launching a ballistic missile against a hospital in Syria's Idlib province, Russian Defense Ministry spokesman Maj. Gen. Igor Konashenkov told reporters on . "Prime Minister Ahmed Davutoglu who was visiting Ukraine yesterday went as far as to even say that Russia launched from the Caspian Sea waters what is allegedly - I stress - a ballistic missile against a hospital in the province of Idlib. I will say straight away that the Caspian Flotilla has not one ship that is capable of carrying out such a ballistic missile launch," Konashenkov said. "Both reports about hospitals and schools allegedly destroyed in Azaz, of February 10, and in Idlib, of February 15, contain the same input data: Gaziantep, Turkey. The information as to where these fakes were written apparently got published owing to the oversight of the authors or website editors," he said. Syria conflict: Could ceasefire mark a turning point in the war?